Mozilla's Firefox Reality browser now available for Viveport, Oculus and Daydream. Today Mozilla announce that the first release of Firefox Reality is available in the Viveport, Oculus, and Daydream app stores. Firefox Reality browser is using Mozilla's new Quantum engine for mobile browsers. The result is smooth and fast performance that is crucial for a VR browser. In the coming months, Mozilla will be adding support for bookmarks, 360 videos, accounts, and more. 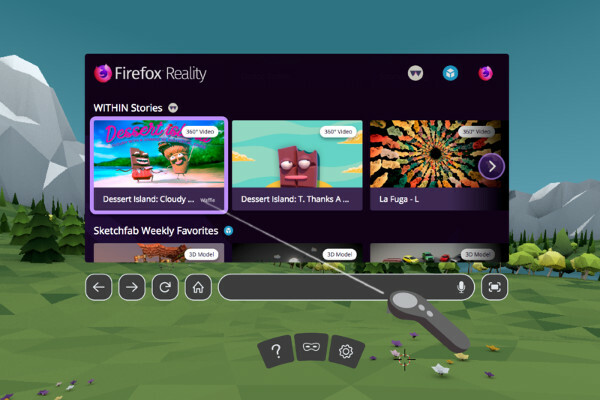 From the moment you open the browser, you will be presented with immersive experiences that can be enjoyed on a VR headset directly from the Firefox Reality browser. Mozilla working with creators around the world to bring an amazing collection of games, videos, environments, and experiences that can be accessed directly from the home screen.